Star of BCA’s Top Car sale at Blackbushe today was undoubtedly a brand new 52 reg BMW M3. 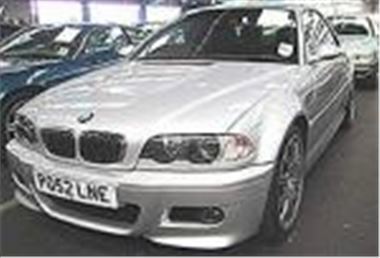 Not just any old M3, but a convertible, with a hard top, satnav and the SMG box. It was top of the list in BCA’s own Top Car advertisement. They’re supposed to be hard to get. There has been a £5k premium. Kevin Haggarty drove one and raved about it on last week’s ‘Pulling Power’. And this car was a peach. I’d have guessed at £50k plus. But the firemen are striking, we're about to bomb Iraq, his Tonyness is warning of gas attacks on the tube and Michael Barrymore blabs he was Princess Di's butler's boyfriend. In this uncertain world in which we live it wasn’t to be. Trade bidding started at a cheeky £40k. Plenty of encouragement saw it finally knocked down to a provisional £48,500. If a rich private punter, or even an agent for one, had been there, it might have been a different matter. But the word is that heavy metal specialists are having a quiet time. One dealer who stocks around seventy and usually sells a car a day has only sold one in the past three weeks. But, of course, when the rich and powerful stop buying, this creates bargains for the rest of us. £19,000 wasn’t outlandish at all for a 38k mile C320 Avant Garde automatic. Nor was £28,750 for a splendid 65k mile S500L fully loaded with almost all the extras in the catalogue. Fancy a nice 5-Series V8? You could have had a 47k mile 98S 540 auto for £14,700, or an almost identical 47k mile 98S 535 auto for £13,500. Seduced by an S-Type? A 64k mile 2000V 4.0V8 sold for £14,100. Lusted after a Lotus? A new shape 7,000 mile 2001/51 Elise bid to a provisional £16,100. Promised someone special an SLK? A 44k kilometre 99T 200K six-speed, which has been making regular Top Car appearances, could have been yours and hers for £13,750. Oddballs in the snatchback section included a 2001Y reg Lexus LS430 complete with performing rear seats. But the front tyres were heavily worn on the shoulders, the rear end looked sagged a bit, and the remains of a removable towbar kit could be seen under the back bumper. 41k miles were unwarranted, but 41k miles towing what? A yacht? A big, shiny caravan? A greaseburger stall? It bid to £29,100. Alternatively, how often do you see an SL600? This Puerto Banus land yacht of a few years ago had 52k unwarranted, was on a 97P and sold for £26,400. Back down to earth in the fleet sale next door, 2001Y Micras with PAS have been re-emerging from their lives as bodyshop courtesy cars. Seems you now have to pay between £3,100 and £3,300 to get your hands on a 15k miler, which makes them quite good value for a simple, economical, Group 3 insurance car. A 2001Y Fiesta 1.25 16v Freestyle with PAS, a CD player and around 15k miles now sells for around £4,500. And a 2001Y Corsa 1.2 16v Comfort with similar mileage is about the same sort of money.